Vice President Pence, seen here at a Feb. 24 speaking engagement in Las Vegas, was the highest-ranking administration official to attend the Gridiron Dinner on Saturday. Vice President Pence came to the annual Gridiron Dinner looking ever-so-slightly underdressed. "I thought I'd be OK wearing a black tie tonight," he joked. "Then Nancy Pelosi asked me to refill her coffee." Pence was the highest-ranking official at the annual white-tie event hosted by the Gridiron Club, an exclusive group of Washington's top political reporters. At a time when tensions between President Trump and the press are as high as ever, Trump declined his invitation, instead spending the evening at his Mar-a-Lago estate in Florida. He has also made known he will be the first president in decades to skip another traditional event with Washington journalists, the White House Correspondents' Association dinner in April. In keeping with a long Gridiron tradition, the vice president cracked jokes and took digs in his speech at politicos on both sides of the aisle. To White House press secretary Sean Spicer, whose combative demeanor with reporters has been famously skewered on Saturday Night Live and who was a punchline of several jokes and skits throughout the night: "Sean, I really want to apologize that you didn't get served dinner tonight," Pence said. "When the waiter asked you what you wanted for your entree, you shouldn't have said, 'Sit down, I never called on you!'" To Pelosi, the House Democratic leader, who sat at the head table along with Pence and other top dignitaries: "The president and I hope you never change. Seriously, we're counting on it." Pence peppered his speech with puns and what he acknowledged were "Dad jokes," occasionally taking aim at himself. He joked about new revelations that he'd used his private email — an old-school AOL account at that — for state business during his time as Indiana's governor. Pence joked that his wife had told him, "Now America knows I'm not stuck in the '50s, I'm just stuck in the '90s." There were also words of praise — and advice — for the journalists seated at the tables around him. 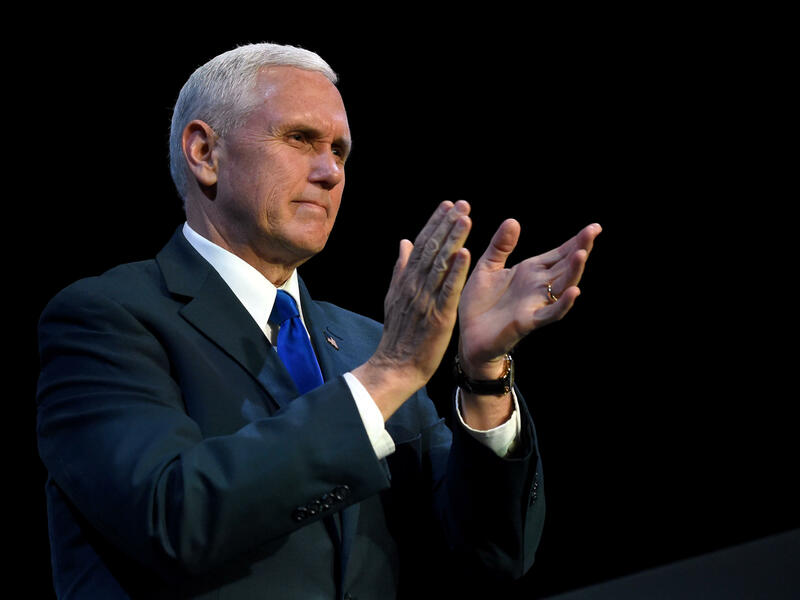 Pence called the press "vital in a free society," and insisted, "President Trump and I support the freedom of the press enshrined in the First Amendment." He reminded the room of his history of sponsoring a media shield bill during his time in Congress. Pence also described news stories with "just too little respect for the people who are affected and involved ... I think we've all just gotta do better," he said, by "focusing on what unites us" — namely, commitments to truth, justice and freedom. Those comments came just days after Spicer banned reporters from several major news outlets from a White House press briefing, and at a time when Trump has continued his attacks on the media, calling mainstream outlets "fake news" and even, "the enemy of the American People!" Freedom of the press was, unsurprisingly, a major theme of the night. Gridiron President Lynn Sweet (disclosure, a friend and mentor of mine) opened the evening with straight talk about the role of the press for Pence and the other Trump administration officials in the room (among them: Spicer; presidential counselor Kellyanne Conway; Cabinet members including Dr. Ben Carson, the newly minted HUD secretary and Transportation Secretary Elaine Chao). She expressed regret at Trump's absence, saying he's a "busy man" with many things to do, like tweeting without evidence allegations that former President Barack Obama wiretapped Trump Tower during the campaign. "What a narcissist," Sweet joked. "Everyone knows it was only to listen to Putin." Revenge of the theater kids? Imagine the kids in high school who were really into music and drama — then add a few decades, professional staging and a heavy dose of politics. At the Gridiron, some of Washington's top journalists entertain guests by singing, dancing and dressing up as the political figures they're roasting. The stars of the show were impersonators portraying Trump, the Clintons, Conway, Spicer, and — in horns and a forked tail — White House Chief Strategist Steve Bannon. Conway and Spicer looked on, sometimes smiling and Conway waving at the crowd at least once, as their counterparts skewered them onstage. The section dedicated to roasting Republicans opened with a line expressing sympathy for the "most downtrodden, least powerful demographic in America today," then launched into "White Man's Brigade," a parody of the Village People classic "YMCA," sung by a choir of journalists wearing red ball caps. There was "We're a Bunch of Rich Men," a spoof of "If I Were a Rich Man," from Fiddler on the Roof. A female choir member sang, "At Education, yeah, I'm Betsy DeVos — I'm rich even though I'm just a girl," to which the men responded, "A girl or two, you know they're just for show." In "We're Trump Family" (a parody of "We Are Family") performers, including a woman in a long, blonde wig as Ivanka Trump, mocked Trump's failure to cut ties with his business interests. "This is our plight song/'Should we move right?' song/'We need more whites' song." "Heartland feels misunderstood, we'll organize your neighborhood./ You think you could, from Hollywood?" "She shuns the press afraid of her own shadow./I'm plenty brave when I'm on Rachel Maddow./As a nominee don't second guess her. Yeah, the Rust Belt needs another law professor." Another tradition involves a comedy routine from a representative of each major party. For the first time in the Gridiron Dinner's 132-year history, both speakers were women: Pelosi on behalf of the Democrats, and Iowa Republican Sen. Joni Ernst. Pelosi's punchlines focused on Trump and included a few jokes at the expense of the press and her own party. On unrecognized similarities between Trump and the media: "You both are obsessed with your brand; you both succeeded in defeating Hillary Clinton, and most of all, neither of you were prepared for Donald Trump to be president of the United States." Pelosi went on: "What you don't know is President Trump is considering a new plan for the First Amendment: It's called 'Repeal and Replace.'" In one fell swoop, Pelosi knocked Trump's tendency to pick insiders for his Cabinet despite his working-man appeal, and Clinton's reputation for earning top dollar for behind-closed-doors Wall Street speeches: "This president has appointed so many people from Goldman Sachs to high positions that there's nobody there left to listen to Hillary's speeches. On Trump: Ernst joked that he'd direct messaged her on Twitter, asking, "Since when are there THREE branches of government? Unfair!" On Pence: "Do you realize he is just a heartbeat away from being second in command to Steve Bannon?" On 2016 Democratic nominee Hillary Clinton's failed campaign strategy: "Hillary refused to come here — she must think this is Wisconsin." On severe storms in California: "I heard that in California 100,000 people have no power; Nancy Pelosi said, 'Join the club.'" On a serious note, Ernst talked about her service with the Iowa Army National Guard in Iraq, where she observed the work of former Des Moines Register reporter John Carlson to document the experiences of U.S. troops. She read the names of journalists who did not survive similar assignments, who "gave their lives in search of the truth." Apparently taking aim at the "fake news" attacks on the media from the Trump administration, Ernst said, "Just because you don't like something you read doesn't mean it's fake."